This entry is part 9 of 10 in the series Laravel Application Container and Magic Methods. Earlier posts include Laravel Objects, PHP ArrayAccess, Binding Objects as Laravel Services, PHP Magic Methods and Class Aliases, Unraveling Laravel Facades, Laravel Facade Troubleshooting, PHP Traits, and Laravel's MacroableTrait. Later posts include Eloquent ORM Static Meta-Programming. You’ll notice Laravel binds cache as a shared service, meaning there’s only ever one instance of the Illuminate\Cache\CacheManager object. that you’d want to look at Illuminate\Cache\CacheManager. However, if we look at this class definition, of the 14 methods defined on the CacheManager class, there’s not a put or get among them. At this point, if you’re an inexperienced developer, or even an experienced developer new to Laravel, you may think you’ve followed the facade indirection chain incorrectly — that the Cache facade actually locates a different service, or maybe something’s extended Laravel to make the service identifier cache point at something else. While an understandable conclusion, that’s not what’s going on here. The Illuminate\Cache\CacheManager class is the cache service, and the Cache facade does point at the cache service. What’s actually happening is another level of indirection. While this may seem needlessly confusing, this indirection is what allows Laravel to support multiple cache engines. In other words, it’s why you can store cache values in Memcached, Redis, a database, the filesystem, etc. Where things start to get interesting, and more confusing, is in the driver method. We’re going to follow the method invokation all the way down — if it gets a little confusing don’t worry, we’ll sum it up at the end for you. // already a driver created by this name, we'll just return that instance. and then calls that method. Similar to the earlier getDefaultDriver abstract method, it’s the responsibility of the parent class to implement a createFileDriver method. Unlike the previous method, there’s no abstract createFileDriver method. As you can see above, the Repository::get(...) method passes the call onto the store property. The store property contains the instantiated Illuminate\Support\Manager\FileStore. That’s five levels of indirection from a client programmer calling get, to the actual function that does the work of get executing. 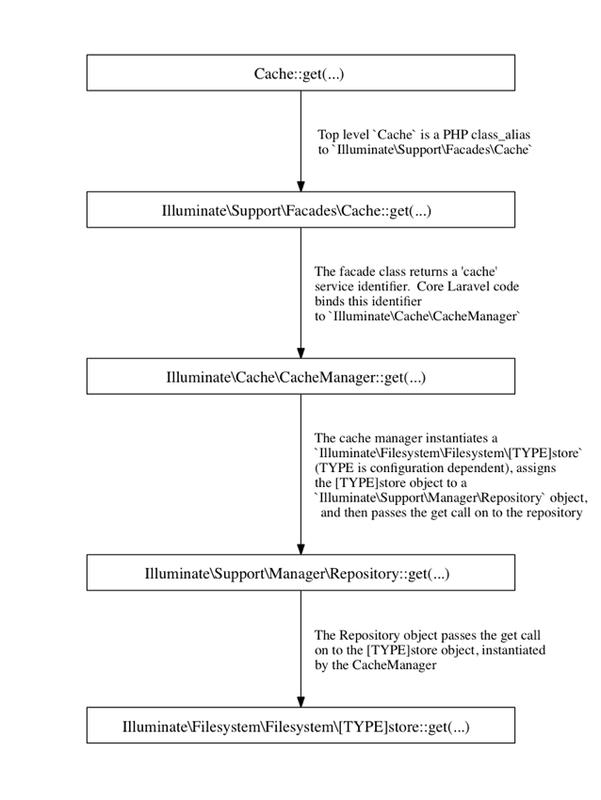 The Cache and Auth facades also point to services that are implemented with the Illuminate\Support\Manager pattern. is one or two levels of indirection. 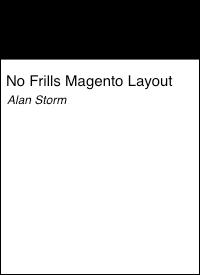 You could argue that Magento’s layout system is maybe two or three levels — but nowhere near Laravel’s five. So why is Laravel embraced by so many when a “less complicated” system like Magento receives scorn for its over-complications? they’re not thinking of the underlying software patterns, and Laravel doesn’t force them to. The basics in Laravel are made super simple. For a programmer to get started in Laravel all they need to do is drop some code in app/routes.php and they have a responding page. To get started in Magento, Zend, Symfony, any many other frameworks, you need to undertake a multiple step process that involves editing configuration files and/or naming controller files in specific ways. Under the hood Laravel’s routing system is just as complicated as any MVC framework’s routing system. It’s just that end-user programmers don’t need to dive into that level of detail to get their job done. One of Laravel’s core values, whether stated by its maintainers or not, is to put the power of modern framework driven programming in the hands of people who might not otherwise understand modern framework driven programming. While this approach has led to massive success and buzz for Laravel, it does create some problems when the framework doesn’t do what a user expects. For example, it’s very common when debugging that you need to dive deeply into framework code to make sure something is doing what you think it is. Most software bugs come down to a mistaken assumption, and the quickest way to undo that assumption is watch the underlying framework code do its job. you have no idea what the underlying class is without going through the above framework debugging. While the Auth and Session facades follow the same Illuminate\Support\Manager pattern, other stock facades implement one off __call logic, which means anytime you want to dig into core service code you need to stop, break flow, figure out where the final implementation class lives, and then return to work. While not a mortal sin, or even a venial one, this is something you’ll need to deal with if you’ll be building long term operational systems with Laravel. While one could argues that the Laravel core is solid enough not to require regular debugging, the ecosystem of third party Laravel code contains many popular but less well programmed packages/modules. This indirection can also lead to confusion with the other Laravel systems that use a static calling syntax (::), but are not considered facades. Next time we’ll explore this further when we look at the static call related features of the Eloquent ORM.